Ribbon Acrylic Awards are shatter resistant, and provide many of the same characteristics as glass and crystal awards at a fraction of the cost. We are pleased to provide a very large selection of the best acrylic awards available today with new acrylic award products being added frequently. This Pink Ribbon crlic Award is mounted on a Clear Acrylic Base. 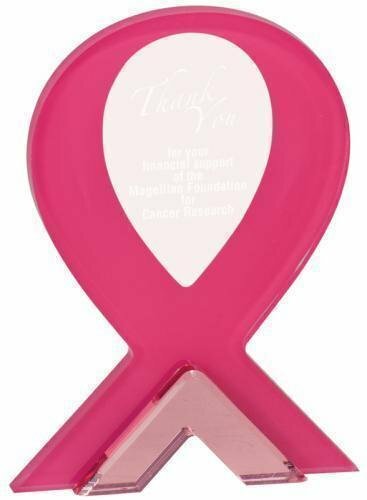 The Pink Ribbon Stand-Up Acrylic award is available in two sizes to meet almost any awards and recognition presentation need. A perfect acrylic award plaque for employee recognition, achievement award recognition, sales appreciation awards and more. 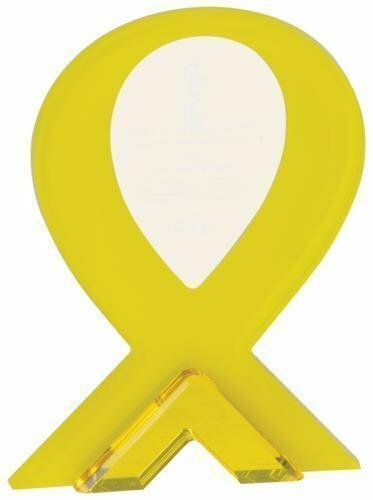 The Yellow Ribbon Stand-Up Acrylic award is available in two sizes to meet almost any awards and recognition presentation need. A perfect acrylic award plaque for employee recognition, achievement award recognition, sales appreciation awards and more.